While not as talked about as the struggle for net neutrality, the proposed merger will have just as profound consequences on the future of the Internet. When Comcast announced it would acquire Time Warner in February, many expected the merger to go through without a hitch. In the intervening months, however, the proposed merger of the two cable giants has hit a number of regulatory hurdles and faced increasingly vocal public opposition. Comcast and Time Warner are the first and second largest cable providers in the country, respectively. Crucially, that means they control large swaths of both the cable television and the broadband Internet markets, as the two run on the same infrastructure. While Comcast’s notoriously bad customer service has become the stuff of viral Internet legends, the implications of the merger go far beyond growing a company that’s hostile to consumers. If allowed, this merger would drastically consolidate the media landscape in the United States, which is a frightful proposition for everyone, but will, predictably, most harm populations that are already marginalized. Before the merger can go through, it needs to be approved by both the Department of Justice and the Federal Communications Commission. If either agency decides that the merger would have a significant negative impact on competition and consumers, they could block the merger. The FCC has more direct authority to affect the outcome of the merger than the DOJ, as it needs to approve that the merger is in the public interest. The DOJ, on the other hand, would have to file a lawsuit under anti-trust law and make its case. For that reason, media reform non-profits such as Free Press and Public Knowledge have come out against the merger and petitioned the FCC to block it. The FCC’s process has been stalled a couple of times so far. First, the public comment period was supposed to end in early October, but was extended through the end of the month. Now, the FCC has paused its review process while waiting for content companies to disclose their programming agreements. Many commentators have speculated that the FCC does not want to make its decision on the merger until after it reaches a decision on the forthcoming net neutrality rules, which could be as early as December, but may be pushed back into next year. Despite these delays, the merger is still far from dead. To make sure it does not get approved, the Center for Media Justice, Fight for the Future, Free Press and other groups are organizing at the grassroots level to demonstrate popular support against the merger. Comcast and Time Warner do not compete for customers in any locale. Comcast has tried to spin this fact as a positive. The cable giant argues that since Time Warner is not a competitor, their merger cannot negatively impact competition. (This despite the fact that in justifying its purchase of NBC to the FCC, Comcast cited Time Warner as a competitor.) In reality, this situation only demonstrates that consumers lack choice when choosing a cable provider and the Comcast-Time Warner merger would make an already bad situation worse. The merger would also make it more difficult for a new company to enter the cable market. Because running a cable company requires a major investment in physical infrastructure, any competing company faces an uphill battle to gain a share of the market from one of the major players. Unlike in other countries, where regulations allow multiple companies to run on the same physical infrastructure, in the United States, any new company must first create its own cable infrastructure in order to deliver their services. Reducing the number of competitors in a market that could already be characterized as an oligopoly would only make it that much harder for a new cable company to start up. Although the proposed merger has not garnered as many headlines as the ongoing fight for net neutrality, it will have just as profound consequences and in some cases more direct ramifications on the future of the Internet in the United States. Most concretely, the merger could result in higher prices for broadband Internet service, which would hit those who are economically disadvantaged the hardest. “The merger could really negatively affect people who already have trouble accessing the Internet right now,” said Kevin Huang, campaign manager at Fight for the Future. Such a disparity in Internet access is a textbook example of institutional oppression. Not being reliably able to get online and with enough connection speed to use modern web applications has a ripple effect that robs disenfranchised populations of economic opportunities. If people cannot afford faster Internet or live in an area without reliable broadband, then they miss out on educational opportunities that will in turn limit prospects for employment or gaining advanced degrees. The merger, if allowed to go through, will have a dual-pronged negative impact on disenfranchised communities, according to media reform groups. By acquiring Time Warner, Comcast would gain footholds in two of the largest media markets in the country, New York and Los Angeles. Comcast would have an even larger audience for promoting the programming of its wholly owned subsidiary NBC, including Spanish-language network Telemundo. Comcast’s purchase of NBC was already controversial for creating a form of “vertical integration” wherein consumers are purchasing their television subscription from the same company providing the programming content. In urban areas like New York and Los Angeles that are home to many people of color and working class people, a single company would have a staggering level of control over what content is watched, as well as how it is watched. Residents of rural areas face their own problems. Namely, that they often do not have broadband cable Internet access and are stuck using slower and inferior methods of getting online. Because rural areas by definition are less densely populated and the cost of laying cable remains more or less constant, it often does not make sense financially for cable companies to bring their services to rural areas. One of those obstacles is the concentrated political power that the cable giants hold. One example of Time Warner pursuing its own interests to the detriment of ordinary people is in North Carolina, where the company lobbied in support of a bill banning municipal broadband. City-run or municipal broadband exists in a handful of areas around the country, but telecom companies have done everything they can to stop its spread. Cable companies are frightened that city-owned broadband could compete with their own offerings by providing the same service at a lower price. Frightened by the precedent that community broadband could set, even in remote rural areas, they have thrown their full weight into the ring against it. “This is despite the fact that Time Warner has absolutely no desire of building out in those areas,” Renderos said. Meanwhile, Comcast spent over $100,000 lobbying against a paid sick days bill in Philadelphia, which houses its headquarters. In fact, the cable giant has used its political influence to undermine workers‘ rights at every conceivable turn. If Comcast is allowed to become an even larger company, it will be able to exert its will more effectively. “This merger would create a situation where marginalized communities have less and less say over the infrastructure that they need as well as the political process,” Renderos said. If allowed to tighten its stranglehold on the political process, Comcast would be in a unique position to affect policies at all levels of government, according to activists. In the current political landscape, activists are up against a lack of political will on the part of regulators. Comcast is the seventh biggest individual spender on lobbying, ahead even of giants like Exxon, Lockheed Martin and Google. To counter this concentrated political power, the Center for Media Justice is building counter-power in the Media Action Grassroots Network, or MAG-Net, which Renderos described as “a local-to-local network of 175 organizations around the country.” MAG-Net’s member organizations work on a variety of social justice issues, including prisoner rights, affordable housing, immigrant rights and more. One such MAG-Net group is the Media Mobilizing Project, based in Philadelphia. Media Mobilizing has been organizing the CAP Comcast! 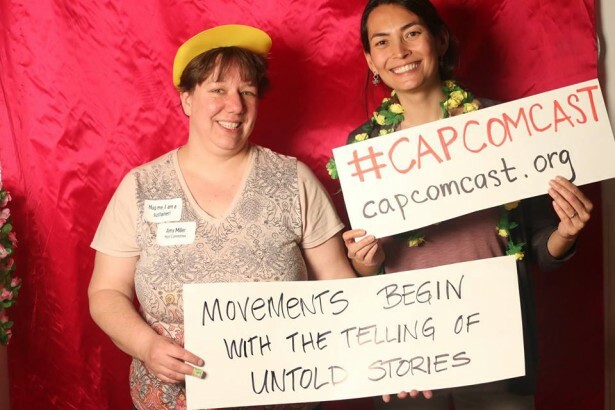 campaign both to limit Comcast’s power in the media world and to hold the company to its agreements in the local community. Media Mobilizing has held rallies in front of Comcast’s headquarters in Philadelphia, expressing grievances with Comcast on a local, rather than national scale, and bringing the fight to Comcast’s doorstep. Large media non-profits have filed formal petitions to the FCC and groups like Fight for the Future have used the power of the Internet to collect signatures from thousands of people. While formally engaging the state’s process and registering the will of the people are important tools, they alone are not enough. The FCC is far more likely to pay attention to these positions if they are backed up by actions that bring people together offline. “We need to see lots of creative nonviolent tactics that can engage thousands of people from diverse communities to take action both online and in person, in order to secure a free and open Internet that is widely accessible to everybody, especially marginalized communities,” Rousset said. The event in Brooklyn last month is a first step in that direction. All of the major media activist groups — including Free Press and MAG-Net — organized a public hearing to follow the rally. 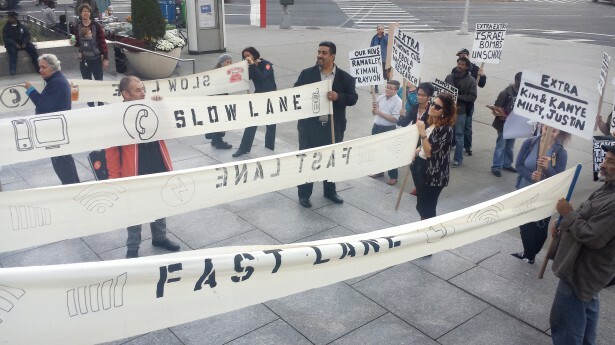 Attended by 200 people, the purpose of the hearing was to give a platform to regular people, especially poor people and communities of color, about how the Comcast-Time Warner merger and net neutrality would affect their communities. It has been more than five years since all of the FCC commissioners left Washington, D.C., to hold formal hearings to learn about how their policies affect communities around the country. The hearing in Brooklyn prominently featured five empty chairs — one for each absent FCC commissioner. The event in Brooklyn kicked off a planned nationwide series of public hearings meant to amplify the voices of those ignored by the FCC. November 20 was the second such local event, this time in California’s Bay Area. 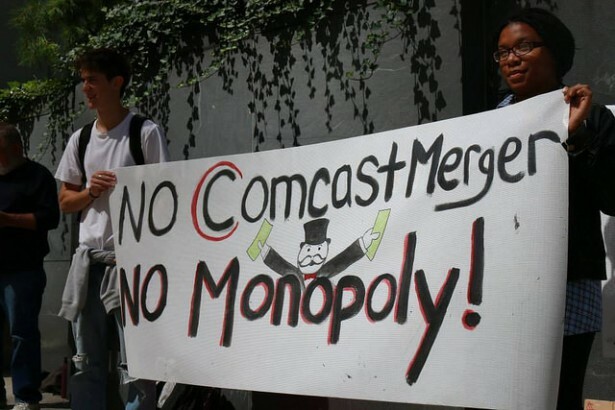 Between this series of hearings and the regular actions of MAG-Net groups like Media Mobilizing, a full-fledged grassroots movement against the Comcast-Time Warner merger is starting to take shape. The task falls to a handful of organizers to keep the momentum going. Because without a movement behind them, calls to stop the merger — and protect net neutrality — can easily be ignored by government bureaucracies. Comcast is so unable to deliver services from their core business that any expansion is frightening. right now my telephone drops calls. My internet connection does not work and I can not access streaming TV all comcast issues.